Getting your kid to eat fruits and veggies, especially greens, is definitely a challenging task. A very good solution for this challenge would be to blend them into a thick smooth drink with yogurt, milk or ice cream. Most kids love this sweet cold treat. A smoothie (also spelled smoothy) is a thick blended beverage with shake like consistency, normally pureed in a blender containing fruits and/or vegetables as well as an added liquid such as fruit juice, vegetable juice, milk, ice cream or even yogurt. 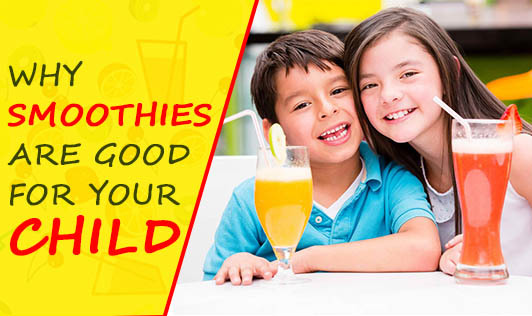 A smoothie contains much higher levels of fiber, carbohydrates, fruit sugars and vitamin C, so one glass is nutritionally more satisfying and can be a good dessert or breakfast option for kids. Traditionally, most smoothies consist of three parts: some type of liquid (often called the "base" of the smoothie), an assortment of fruits and/or vegetables, and ice. If frozen fruit or vegetables are used, the cool temperature can be achieved without using ice. Mix all the ingredients above in a blender, add your favourite cereal on the top if you like and enjoy! Place the banana, juice, yogurt and oil into your smoothie blender and process for 30seconds. Place the orange slices, banana, strawberries and spinach into your smoothie blender and process for approximately 30 seconds.